Staged as part of the Globe's Globe to Globe festival, this urban reimagining of Shakespeare's harrowing tragedy returns to the UK. 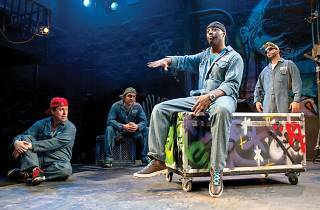 A hip-hop rhythm-based show. Ages 13+. An excellent production that is pay, funny and sad. You definitely feel entertained. I really only went to see this because other theatre buffs raved about it so much; it premiered at the Globe to Globe Festival last year, as part of their 37 Shakespeare plays in 37 different languages. This one was supposedly in ‘Hip Hop’, which when I first heard about, I laughed incredulously to be honest. But it was amazing, seriously, incredible. 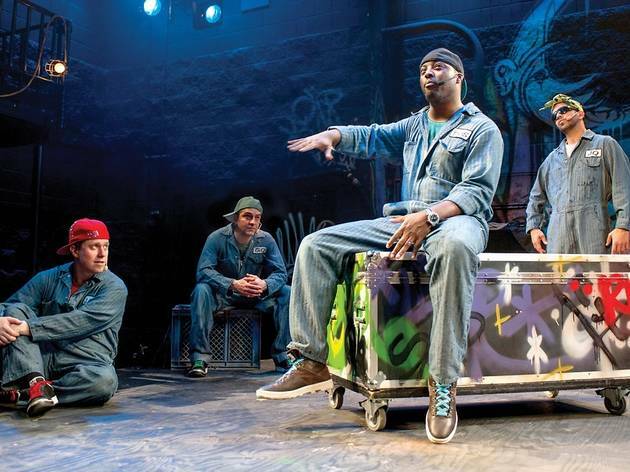 The concept is that Othello (played by Postell Pringle) is a huge rap/hip hop icon (I thought of him a bit like Jay-Z), Cassio (Jackson Doran) is an up-and-coming star, who’s popular with the ladies, and is good friends with Othello and Iago (GQ) is an old rapper, only really known by underground, super fans and jealous of Cassio’s increasing success. Desdemona, who amazingly never appears on stage, is the singer who does those ‘oooohs’ and ‘aaahs’ and twiddly bits and who Othello falls madly in love with. The whole story is told in 75 minutes, no interval and is done entirely in rap. The lyrics are witty, intelligent, Shakespeare-referential and pacy; watching this must be just like watching Shakespeare for the first time – full of up-to-date cultural citations (the CEO of the music company, Loco Vito (JQ), is for some reason obsessed with tennis so we get a lot of references to Nadal, Federer and Murray) and tongue-in-cheek meta-theatrical bits as well as some deeply emotional sections. However, saying this, one of the highlights for me was Emilia (Doran)’s re-worked rendition of ‘This is a Man’s World’ supported by all four other actors, including the DJ (Clayton Stamper), dressed in drag as rather fabulous backing singers! I honestly cannot recommend this show highly enough. If you see one play this year, make it this one. It’s cheap (only £10 for under 21s) and quick enough for dinner afterwards (it’s just 75 minutes, no interval) and, more importantly, it’s completely and utterly hilarious and amazing.